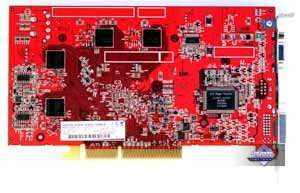 It's been six whole years since the moment fans of 3D games were seeking USD 250-300 to buy the then new 3dfx Voodoo2. Rich ones could even afford buying two such cards to combine their capabilities. 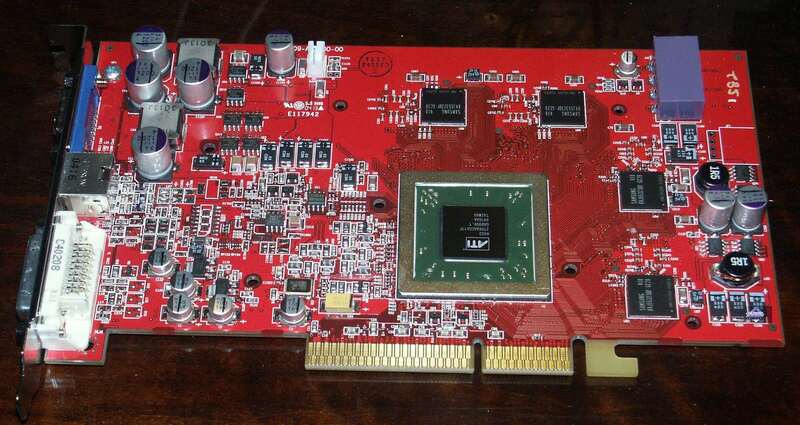 It was the time when fans of Incoming, Farsaken, and certainly, Unreal could first see 3D in 1024x768. 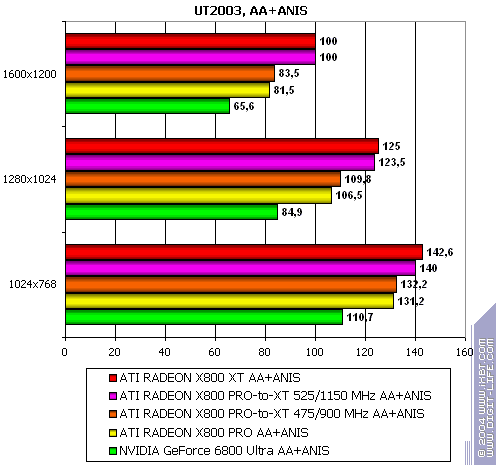 Although now we can admire the beautiful numbers of 200 and 300 fps in such games. Isn't it great? Isn't it what the late 3dfx bequeathed us ("More FPS! 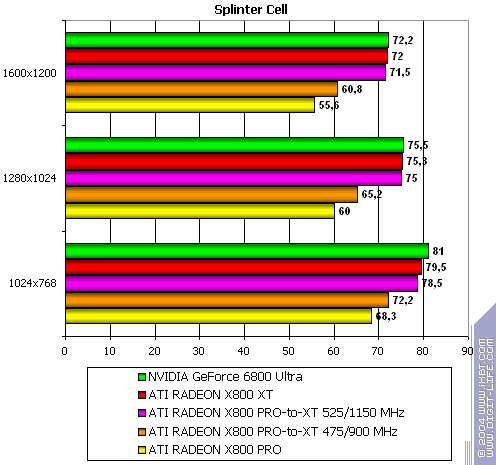 60 fps is the bottom!")? 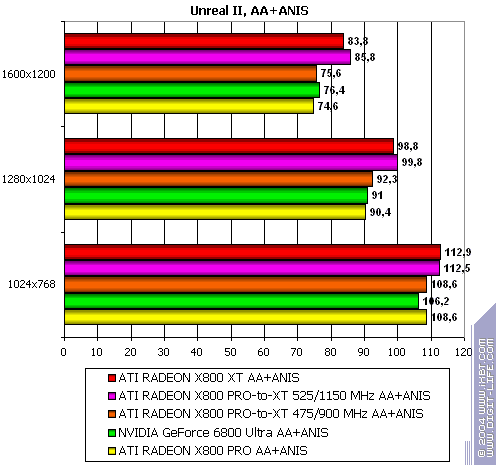 To hell with your filterings, performance is paramount! 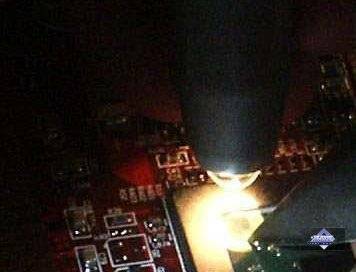 To hell with T&L, let the CPU do what it should (besides, Intel will say 'thank you')! Even now crowds of Voodoo fans still carry transparencies that read, "Glide for the masses! 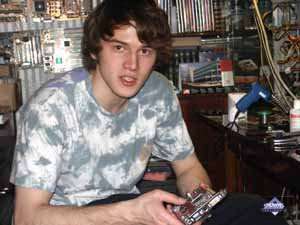 22 bits is enough!". 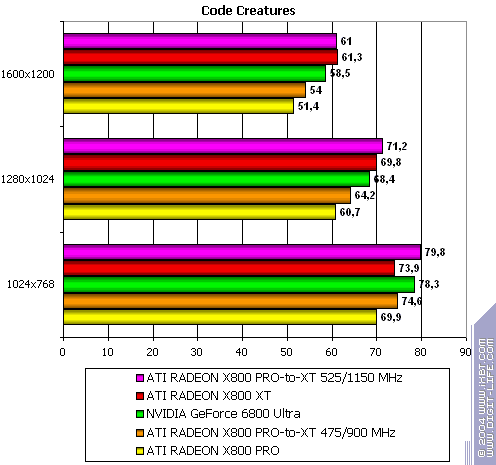 They blame NVIDIA for dethroning Glide and thrusting Voodoo and 3dfx deep into the lists of trademarks. Fans of the company whose logo was like a scorpion crawling up the razorblade of its own foolishness keep visiting this page to lament over old-time hits. 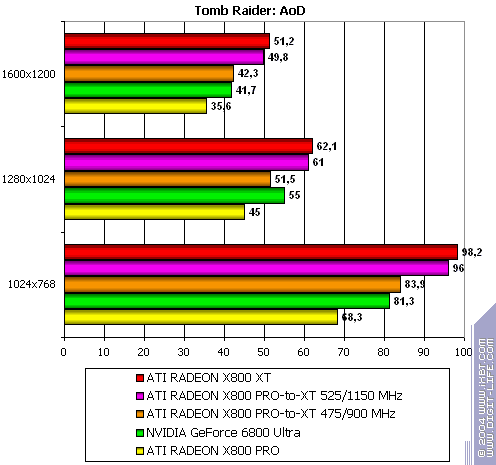 Well, there are still a lot of games with old graphics, and it's getting increasingly difficult to test modern accelerators as benchmarks are mostly in older games (yeah, testers were really cared about then!). However, we already wrote about all this before (see our first articles on R420/NV40). There are only two or three (five at best) games for the moment that can load a modern accelerator to the full. So, is it worth buying them? It's not the first year that we've been buying cards for superpowerful soon-to-appear games. But when that much-anticipated game is finally released, two or three generations of accelerators have already been wasted. Thus, it's been almost a year since we've been buying accelerators for DOOM III and Half-Life2, but neither game is to be seen on the horizon. Meanwhile, three generations have elapsed. So, the question is what befooled users' money is spent for. 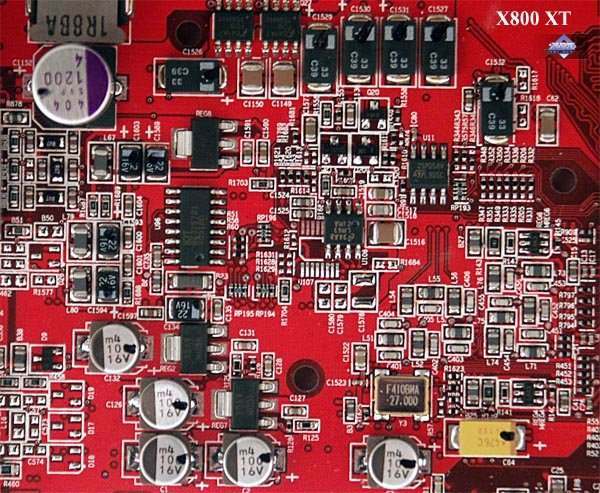 We can only hope that it is used for developing new products, improving production, lowering prime costs, and supporting developers thus urging them to overcome their laziness and introduce modern technologies. But nevertheless, new products were announced in April and May. 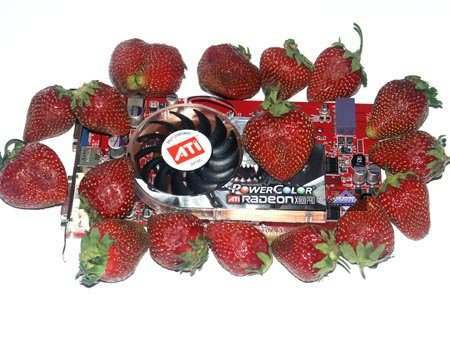 What are they, overclocked versions again? Thank God, no. This time around, the solutions have really undergone radical enhancement (see the list of articles for details). 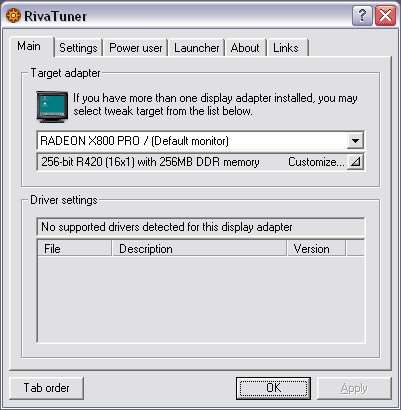 They include RADEON X800 PRO among other cards. It is a High-End product, though not a first-rank (and not even a second-rank) one. But still, it is of great interest to us. 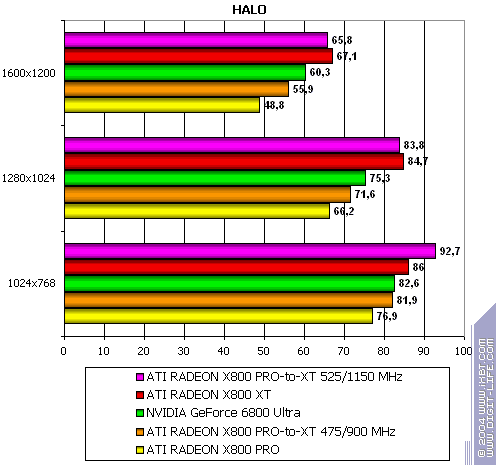 First, it's at least 1.5 times more powerful than its RADEON 9800 XT predecessor. Second, it is the most powerful card for the moment, considering the absence of X800 XT and a very small number of GeForce 6800 on the market. Third, it is susceptible of transformations and can be potentially made into R420. 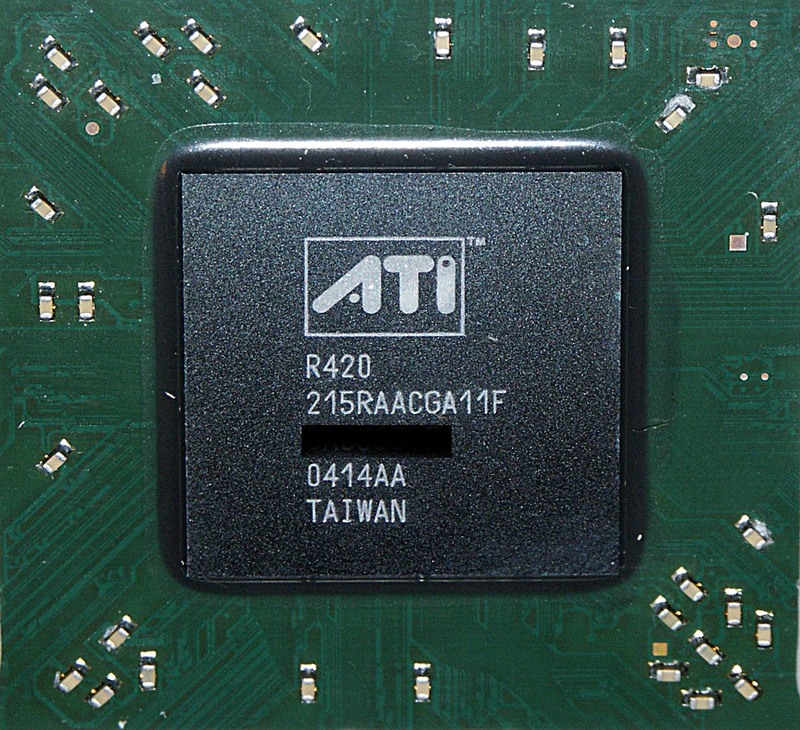 AGP x8/x4 interface, 256 MB GDDR3 SDRAM allocated in 8 chips on the front and the back sides of the PCB. 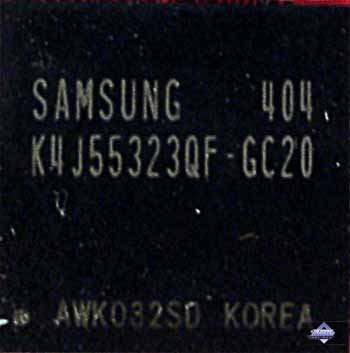 Samsung chips (GDDR3), 2.0ns access time which corresponds to 500 (1000) MHz; 450(900)-MHz memory frequency, 475-MHz GPU frequency, 256-bit memory bus. 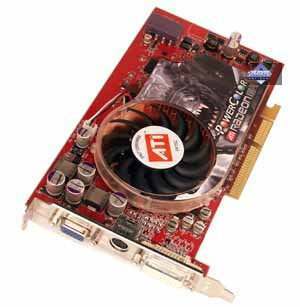 I don't see any sense in describing the card further, as we have the same reference design. 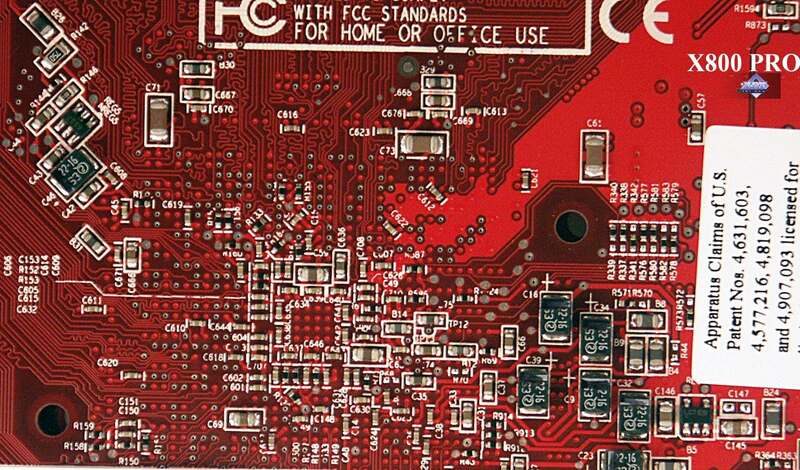 Besides, all X800 boards are produced only in one place and only by ATI orders, vendors just apply their stickers. Let us look at the bundle instead. 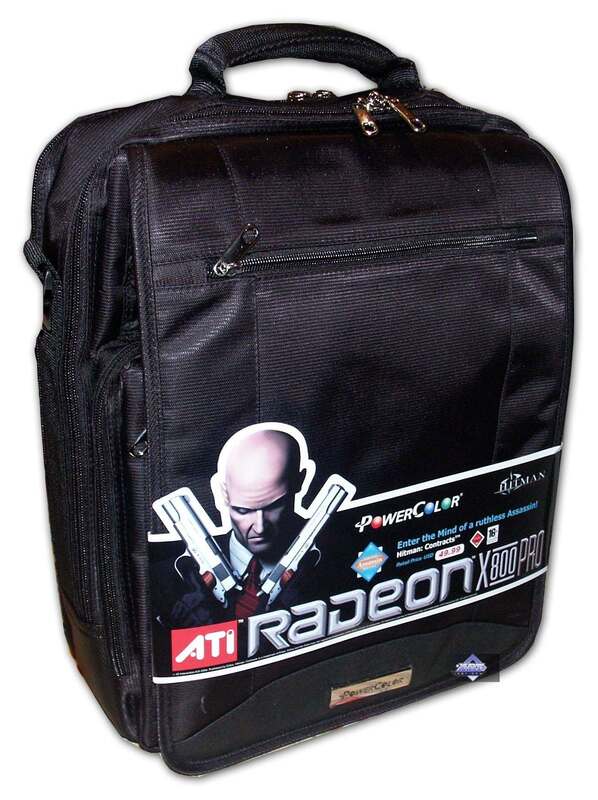 The multiple pockets of the bag contain a user manual, a CD with drivers, PowerDVD, the Hitman: Contracts game, TV extension cables, adapters: DVI-to-d-Sub, HDTV, and SVideo-to-RCA. 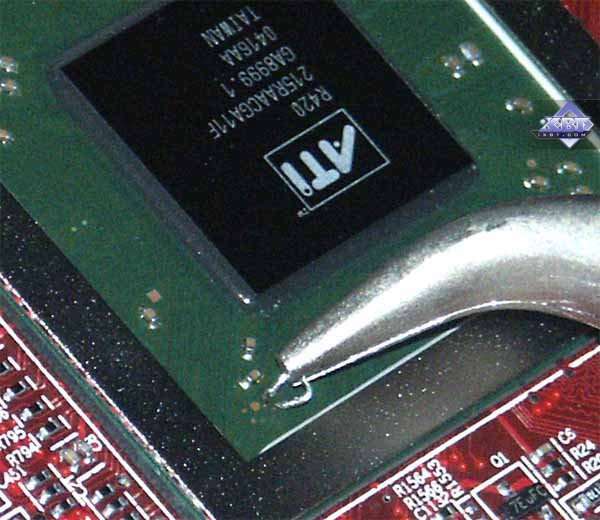 We have already come across such solution (Albatron), but TUL surpasses all our expectations. 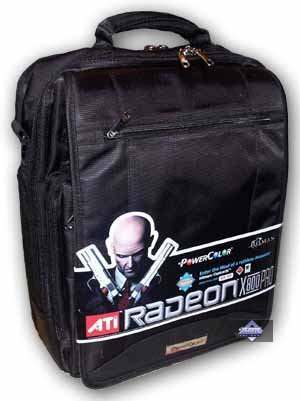 It is not a package, it is a real bag which can be transformed into a backpack. I have repeatedly suggested that High-End products be shipped in corresponding packages and supplied with all sorts of bonuses. 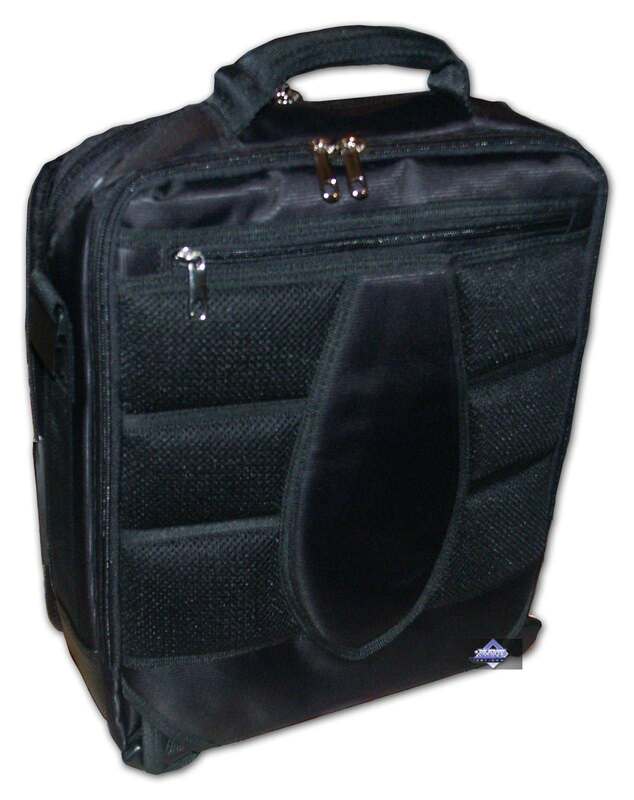 A nice and compact bag is much better than a huge box, both for customers and transporters. 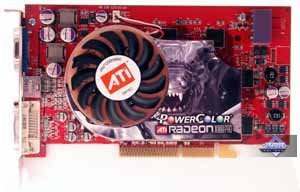 As for overclocking, this particular card showed stable work at 550/1180 MHz providing the presence of an additional fan. 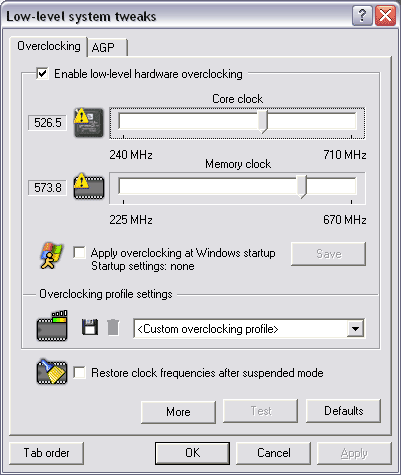 But we repeat that overclocking depends on each particular card and you can't make general conclusions basing on just one of them. Besides, today we'll deal with other things than overclocking :-). 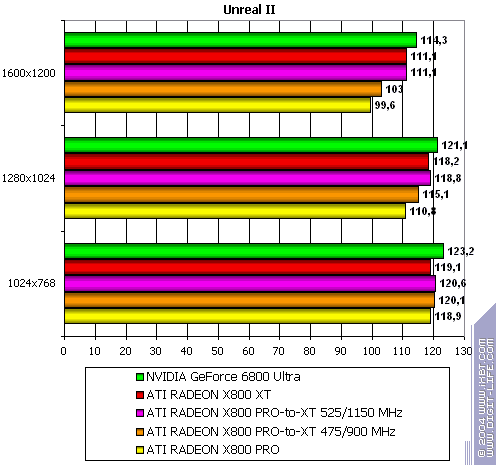 Unreal 2: The Awakening (Infogrames), DirectX 8.1, multitexturing, testing was carried out with the help of an auxiliary Bench'emAll! 2.5beta pack. 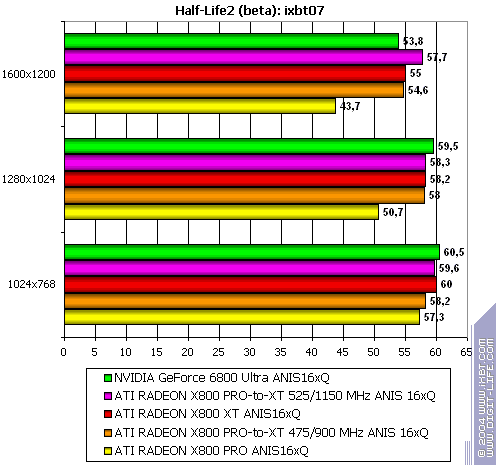 Half-Life2 (Valve/Sierra)  DirectX 9.0, two different demos (ixbt07 and coast). 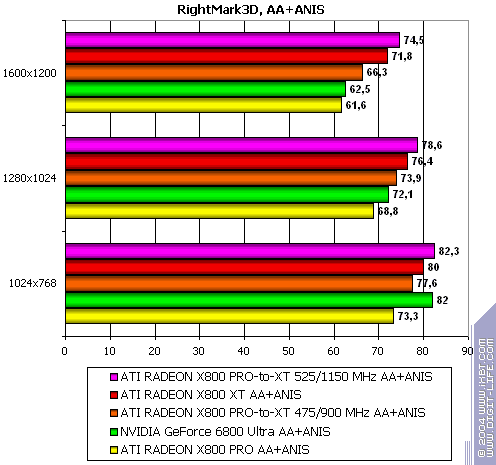 Testing was carried out with anisotropic filtering enabled. Tom Clancy's Splinter Cell v.1.2b (UbiSoft) - Direct3D, Vertex/Pixel Shaders 1.1/2.0, Hardware T&L, maximal quality (Very High); demo 1_1_2_Tbilisi. AntiAliasing doesn't work in the game. 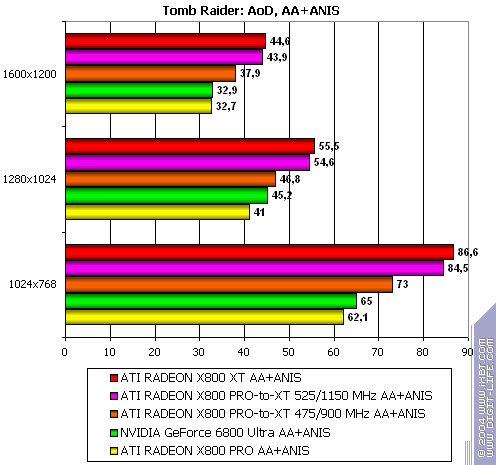 Tomb Raider: Angel of Darkness v.49 (Core Design/Eldos Software) - DirectX 9.0, Paris5_4 demo, test settings are here. 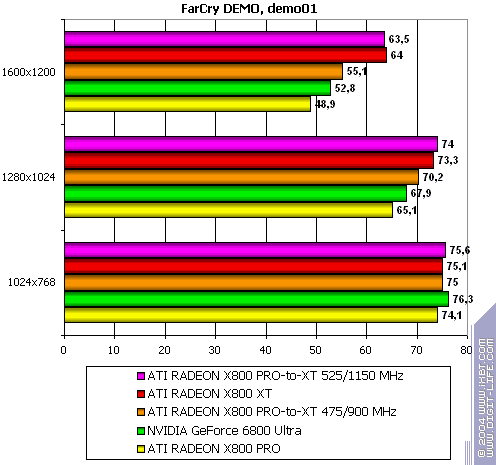 Fac Cry v.1.1 (Crytek/UbiSoft), DirectX 9.0, multitexturing, demo01 (startupo with the -DEVMODE option), test settings are all Very High. 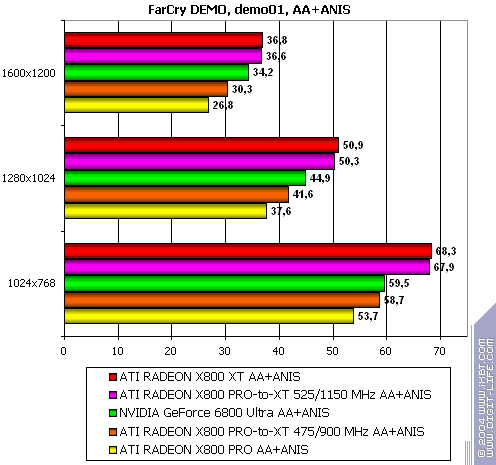 Those willing to get the demo benchmarks we use, please contact me by e-mail. 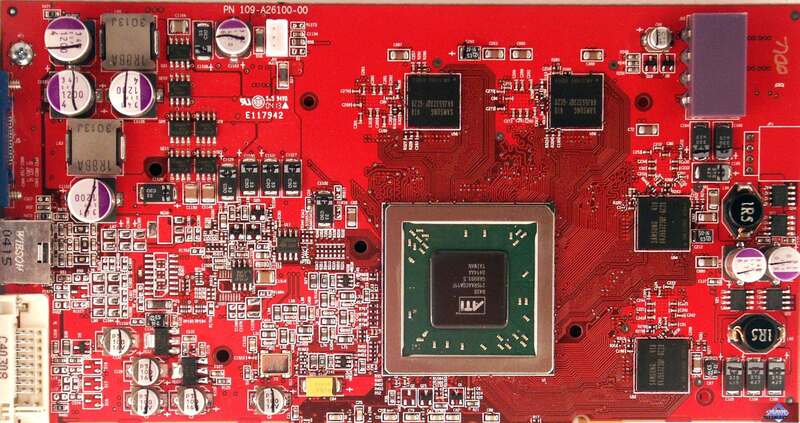 For now, we can only say that the accelerator we're reviewing is more powerful than its predecessors. 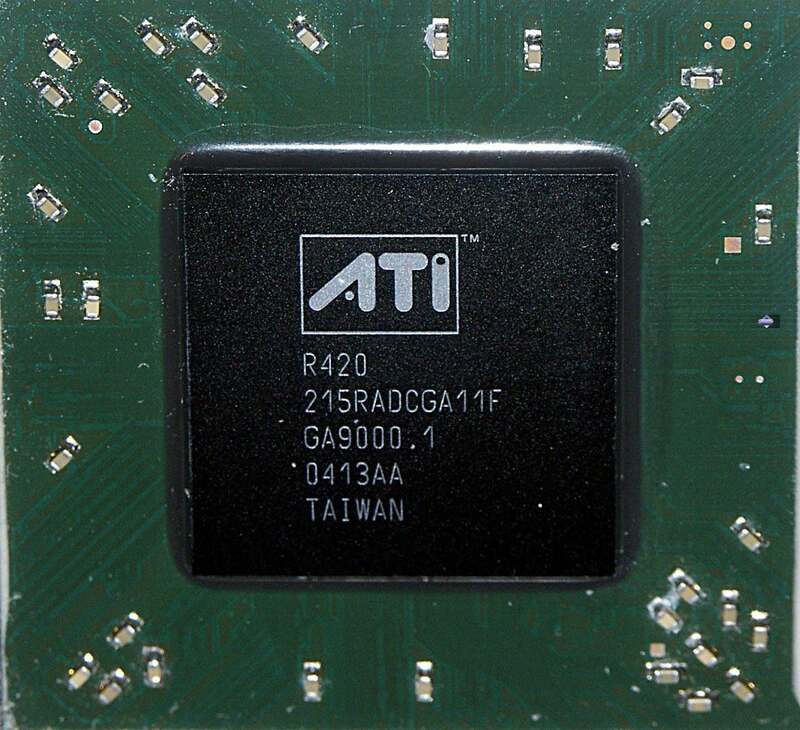 It's too soon to compare it with other new products, as we know nothing about the prices for GeForce 6800 GT, and neither do we know if ATI will release X800 XT (non-Platinum Edition) while the price for X800 PRO will fall. A lot of questions still remain unanswered. 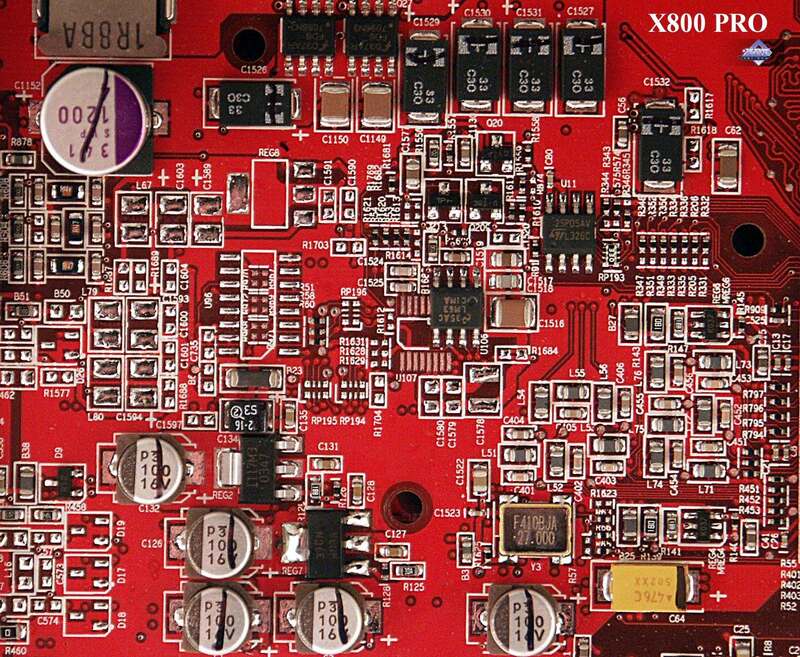 Today, you can buy X800 PRO at USD 500 in Russia. 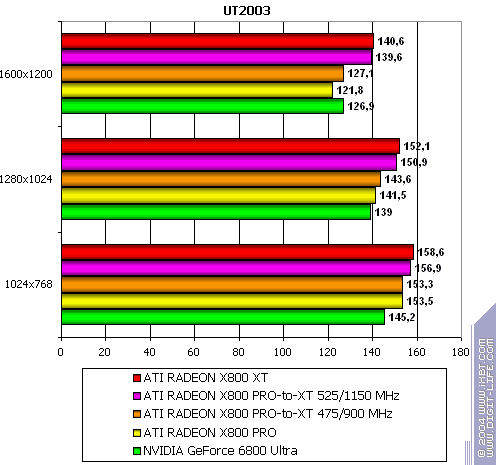 And considering that RADEON 9800 XT is just some 30-40 dollars cheaper, the latter has no chance to succeed anymore. 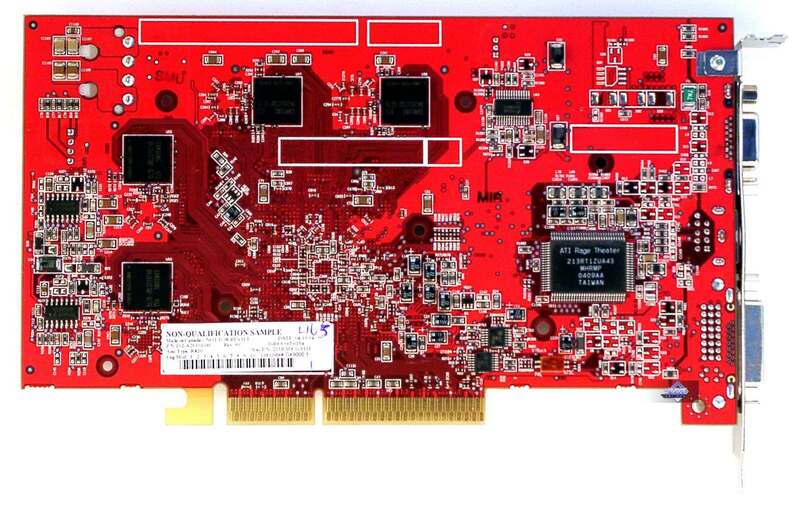 Either its price has to crash down, or the card will disappear from the market whatsoever, thus paving the way for a reduction in X800 PRO prices. Now we've come to the most interesting thing. 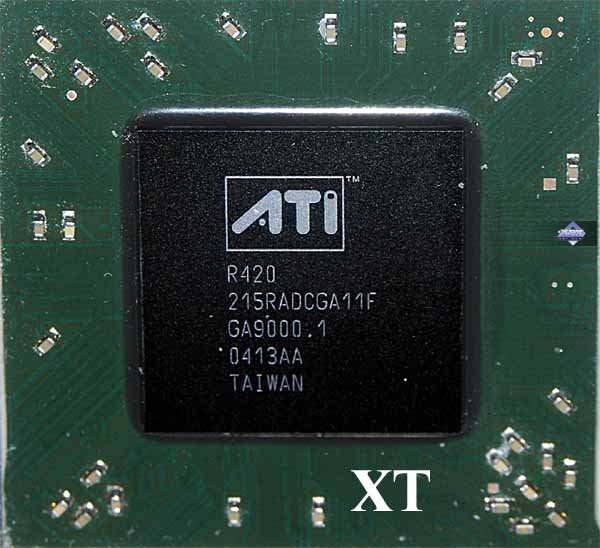 As we see, the only difference is the presence/absence of the element base that supports ATI RAGE THEATER, present on X800 XT and absent from X800 PRO. Here are the reverse sides. What can we see? 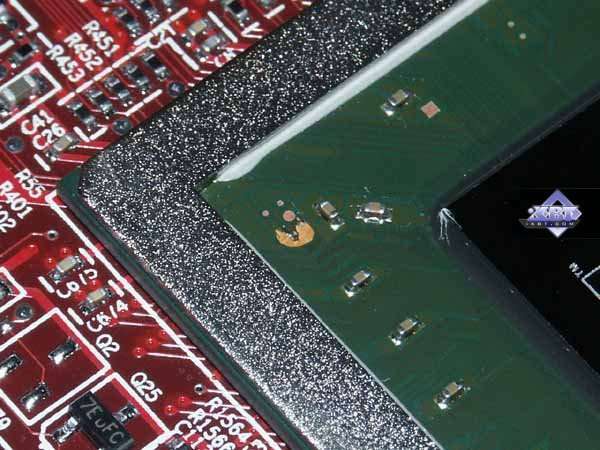 The upper right area has an array of dots that look like contacts for a bridge connection (remember all AMD Athlons and the attempts to unlock the multiplier by connecting similar contacts). 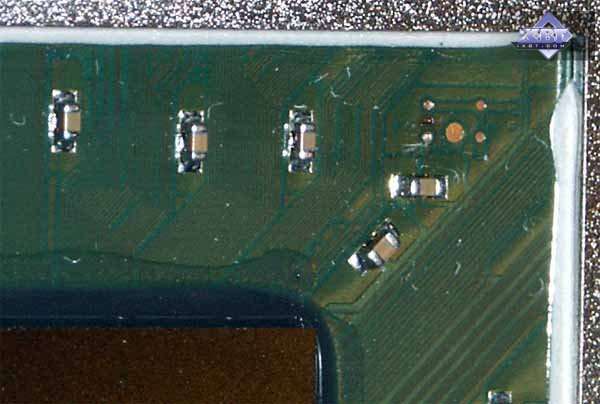 PRO has a dot between the left contacts, XT hasn't. Yes, that is the clue. 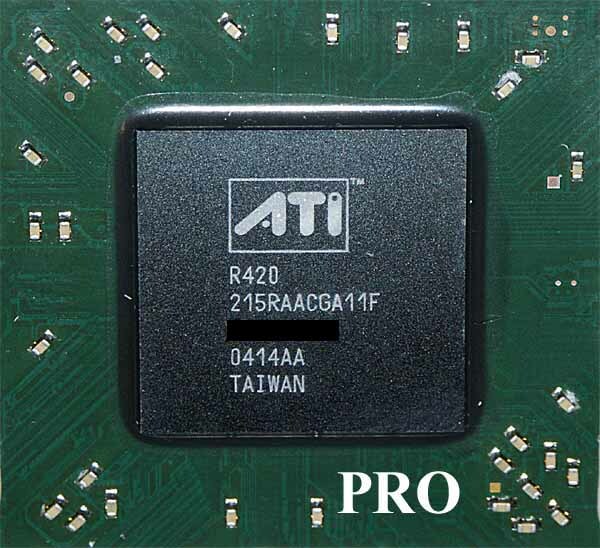 The Net has recently been updated with new materials that claim these contacts can unlock PRO's 4 pipelines to make the chip into XT. 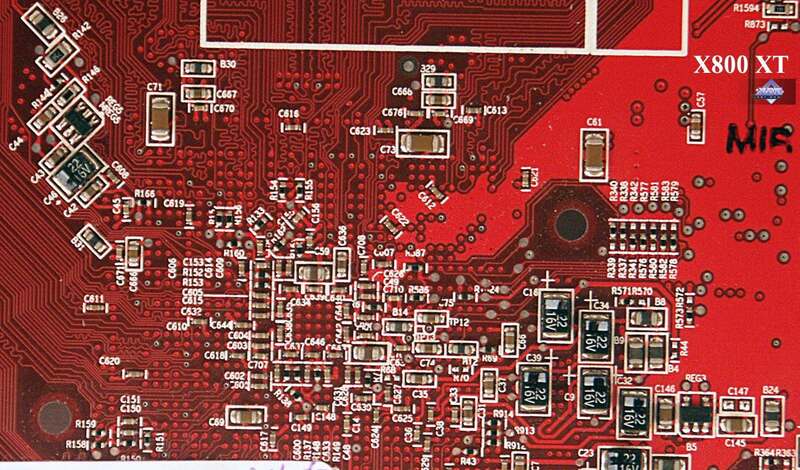 The dot between PRO's left contacts results from the laser cutting the connection between them. 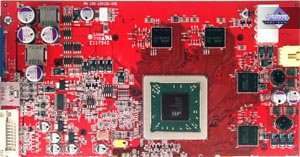 Thus, we only need to connect the contacts and flash XT's BIOS in order to make PRO into XT. We asked Mikhail Ambatiello, a Moscow-wide famous voltmodder (we have his article on 9800 XT voltmod) to assist us in this subtle operation. Then we clear the contacts. And now you can easily tell the two contacts we need from others. 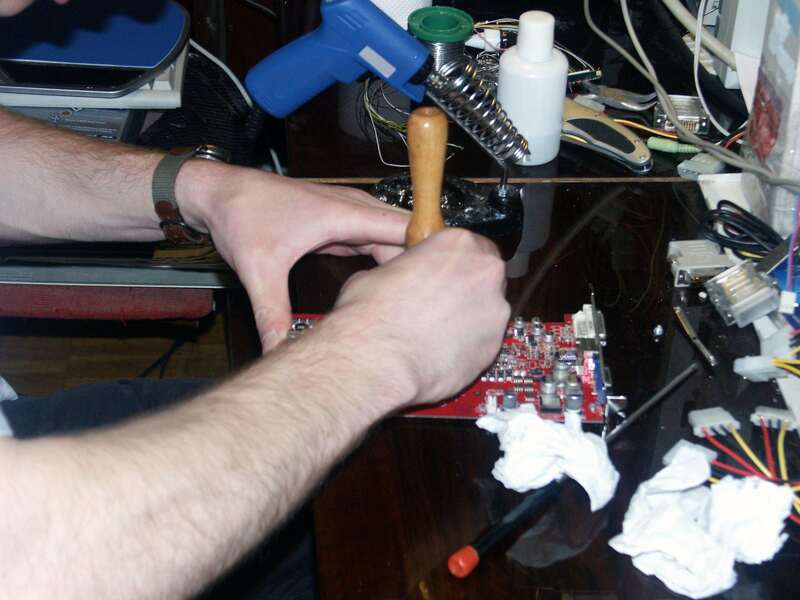 At first, we decided to resort to soldering and you can see our preparations below. 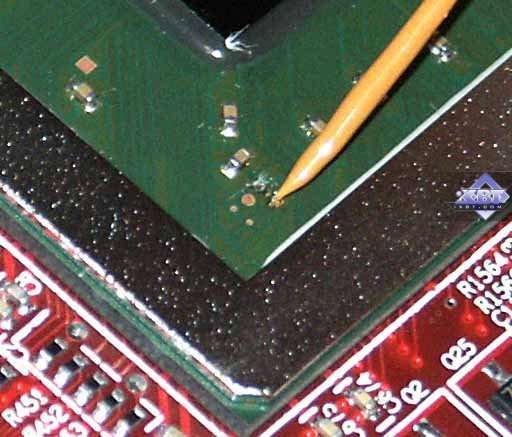 A thorough study of the operable place showed that soldering would be a too rough method, and even the iron with a thin bit proved to be unsuitable for the operation. 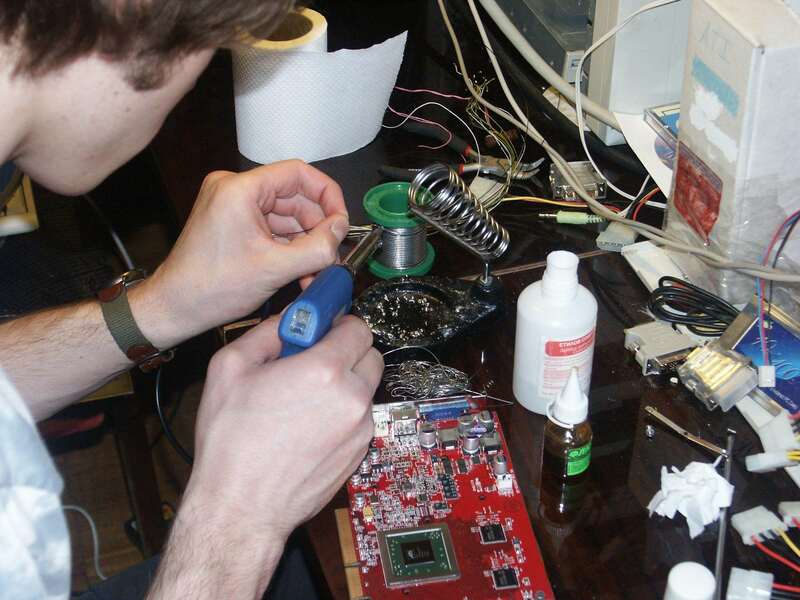 So, we decided to use conductive varnish. Hurray! We made it! 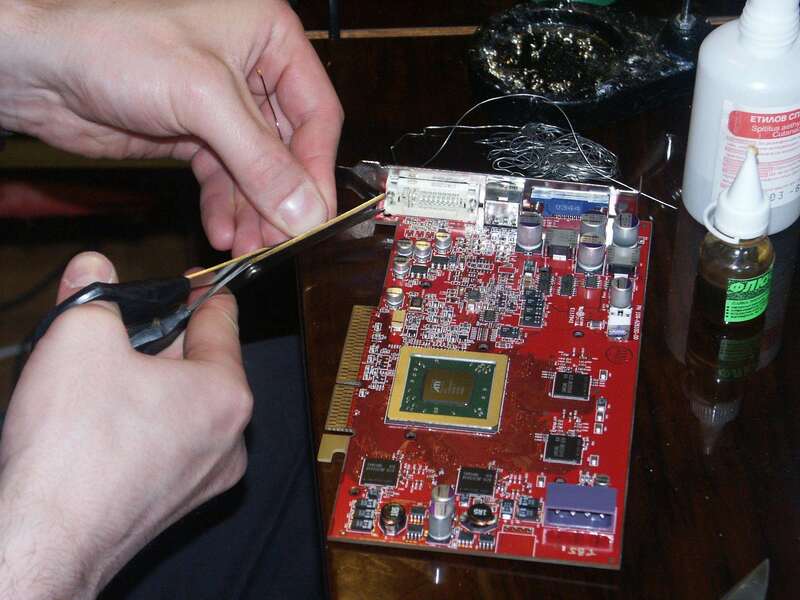 Below, we'll show you the custom-made X800 XT test results at both new frequencies (525/1150 MHz) and PRO's 475/900 MHz. Thus we'll be able to estimate the gain from 4 additional pipelines. 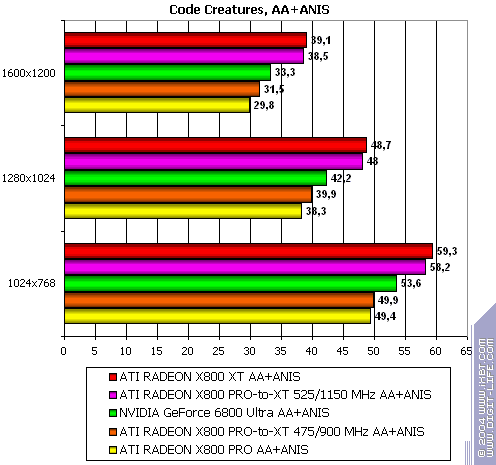 Note that we have excluded the games that have FPS over 150-200 even under AA and AF load. There's no sense in comparing them as the victory of any accelerator is of no interest if performance is too high. 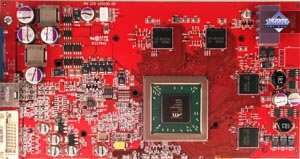 Evidently, 525 MHz, which is overclocking for this chip, raise the temperature quite significantly, and so, one'd better use additional cooling in such cases. I won't comment on each test as the tables speak for themselves. Well, the transformation was definitely a success. 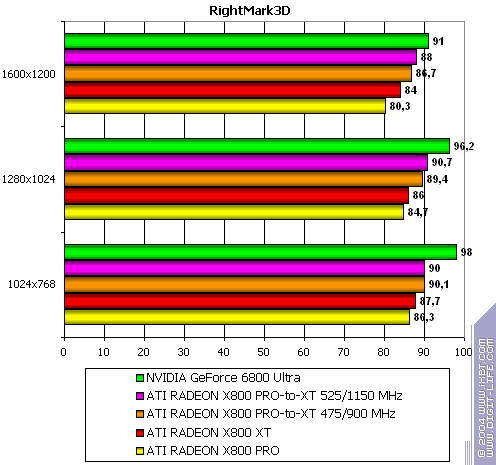 The newly-made PowerColor RADEON X800 PRO-to-XT Limited Edition has practically the same performance with X800 XT (the difference may be accounted for by measuring inaccuracy and different memory timings). The lack of 4 pipelines is essential in games where a great deal of shader calculations is done. 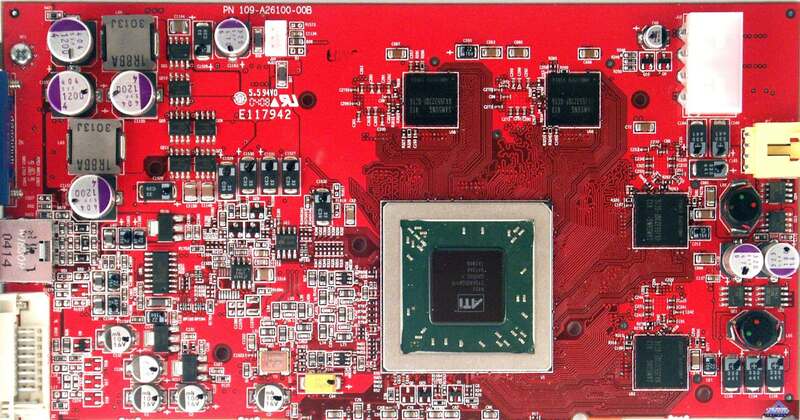 We will start with the analysis of PowerColor RADEON X800 PRO Limited Edition. 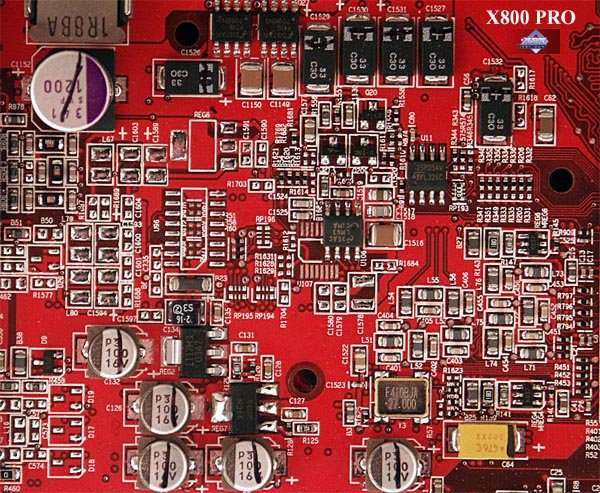 It is a serial card which has little difference from other X800 PRO's as they are all made on the same conveyor (at least for now). 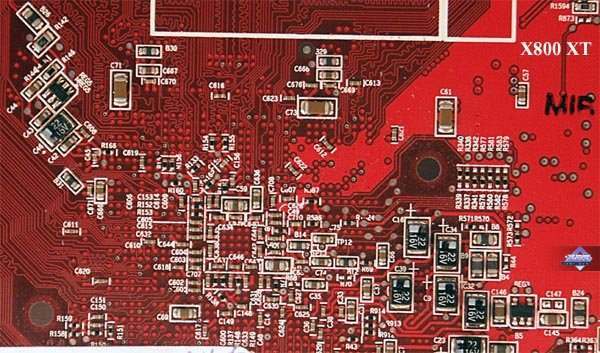 But TUL has come up with an original solution, offering users much more than ordinary reference cards in scanty packages. Besides, the company says the solution won't affect the price, and as we know, TUL products have been quite attractive in this sense lately. 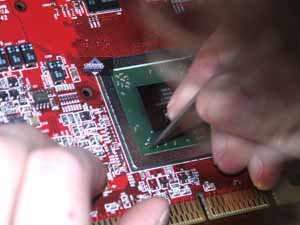 The card itself has a superb quality and shows stable work, no claims about it. 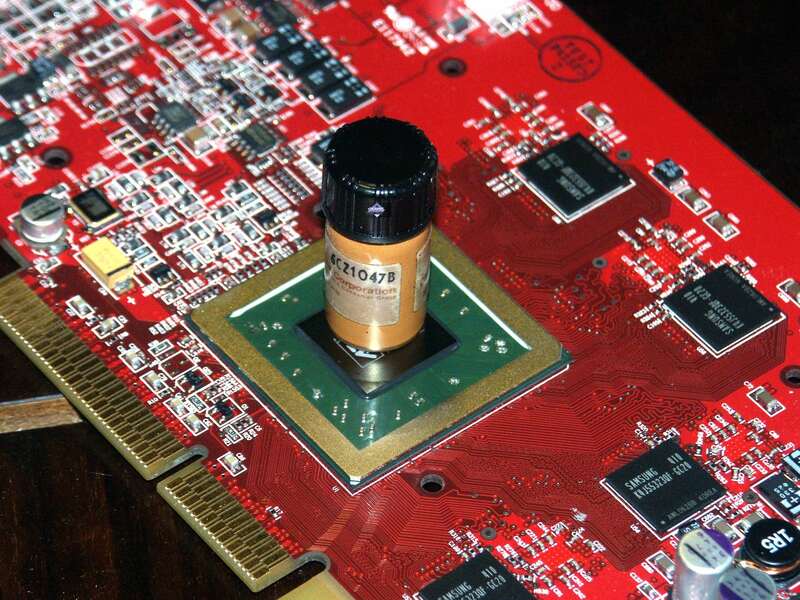 2D quality of Mitsubishi Diamond Pro 2070SB with 1600x1200 is all right at 85 Hz. 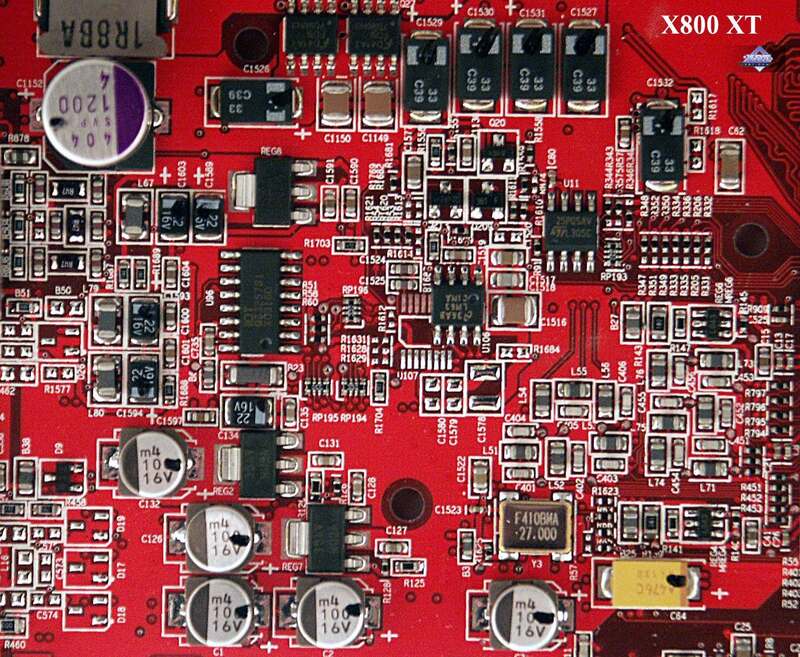 Fourth, it can be transformed into X800 XT. 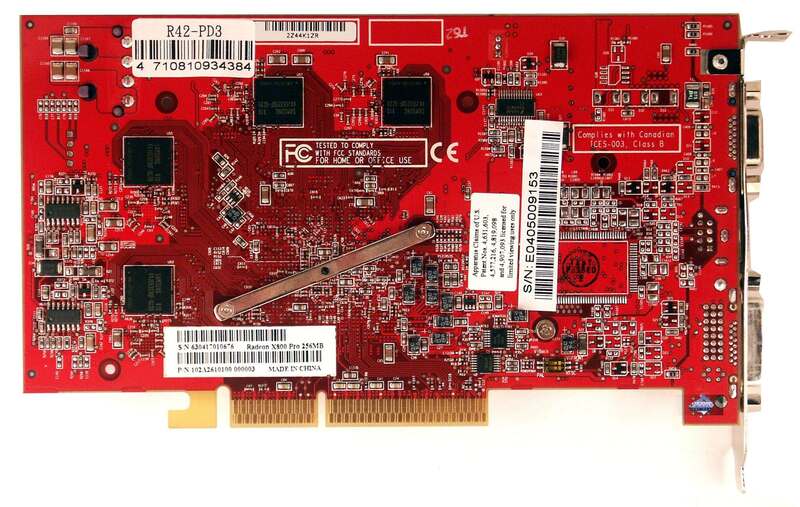 Sure, we were lucky that 4 disabled pipelines of the card were operable. 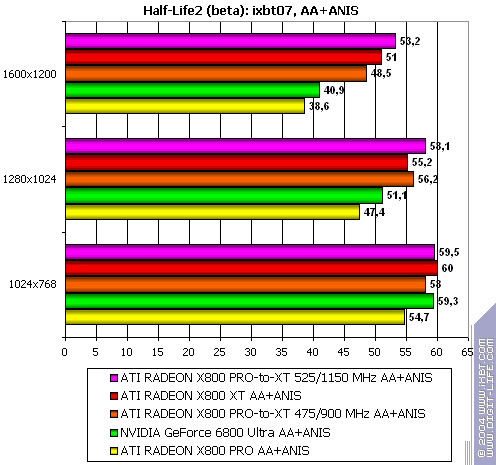 But we can't guarantee the same luck with all X800 PRO's. However, there is the opinion that unoperable pipelines are locked in the die and thus, can't be enabled at all. So, such transformation will get you nowhere and even in the worsrt-case scenario the user loses nothing. But that's just a hypothesis now. 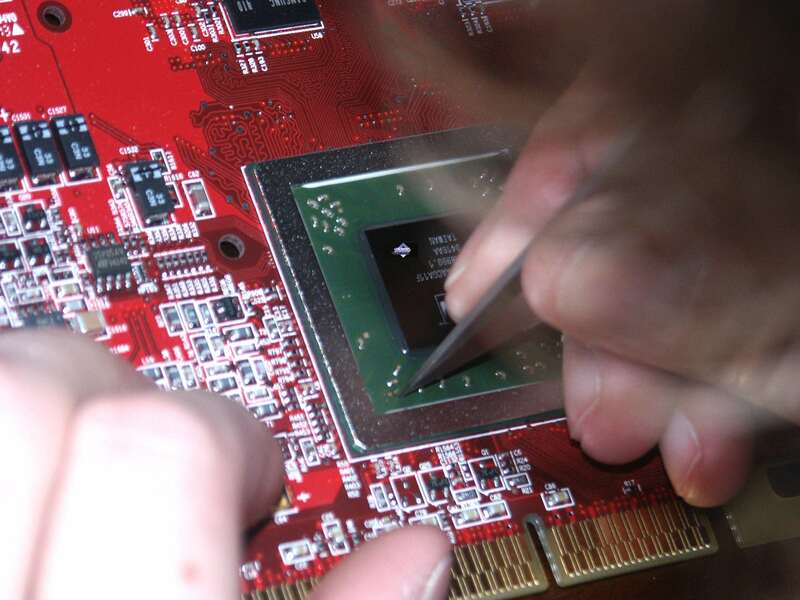 You can see more detailed comparisons of various videocards in our 3DiGests. 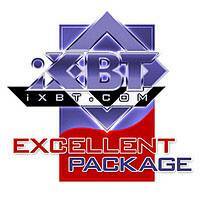 The card is deemed worthy of the "Excellent Package" award (for June 2004).